NORTHERN pair Michael Mattimore and Josie Barker led the victory charge at the 2016 Northern Junior Open. Both players made home advantage count in coming from behind to pick up the coveted boys and girls Under 19 trophies respectively at Gosforth on February 14. Northern Squash Club was packed to the rafters for a tournament supported again by local sponsors QS Lawson & Thompson solicitors. There were nearly 130 entries as talent from Under 11 level upwards descended on McCracken Park from all over the country. 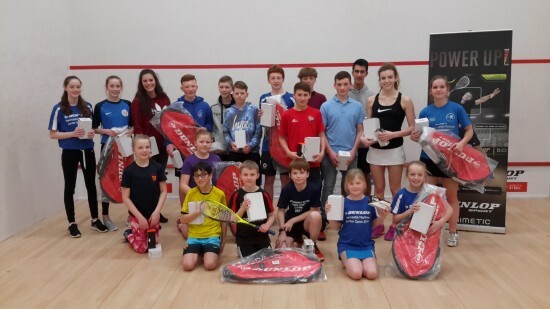 And a club with a burgeoning reputation as a squash academy lived up to its billing – providing 4 of the 10 main event winners on the day, and four losing finalists to boot. Erin Vitty hit top form to pick up the girls Under 17 trophy, while clubmate Andrew Shipley also found his range to take the boys Under 15 honours. With strong entries in all fields, competition was fierce on Northern’s four courts – but the climax of the tournaments, the two Under 19 finals, arguably provided the weekend’s highlights. Michael Mattimore had the toughest of challenges against Tynemouth Tornado Jamie Todd in the boys U19 showpiece – and even more so when Todd opened up a deserved 2-0 lead. But Mattimore showed great tenacity and maturity to battle his way through two close games to level things at 2-2, and looked fit as a fiddle as he took the decider with some aplomb at 11-3, to record his first ever win over his Northumbria County team-mate. Josie Barker has made huge strides on the junior circuit in the last 18 months, and may well have gone into her final against Eve Driver as favourite. But the Cumbrian’s accurate kills helped her carve out a 2-1 lead. The irrepressible Barker fought back to 2-2 only to find herself 7-3 down in the decider. But the home player’s fitness is right up there with the best and her hard-running style earned her a precious 11-7 win in the fifth. The Girls Under 17s was an all-Northern affair, with the fast-improving Erin Vitty edging out clubmate Megan Freeman in the final. And Jesmond’s Max Forster added another trophy to his growing collection when he fought out to see off a strong challenge from Cleveland’s David Collins in the final of the Boys U17s – this one going right down to the wire at 3-2. Top seed Andrew Shipley lived up his billing by winning the Boys U15 even on home turf – clocking up an impressive 3-0 win in the final over Cumbria’s Aiden Raine in a match which was a lot closer than the scoreline suggests. Cumbria took the Girls Under 15s when Michelle Tang proved too much on the day for Yorkshire’s Opelia Watson, while at Under 13’s it was a Yorkshire double. First up, Amy Royle took the girls final with some super squash against a livewire Katie Barker, then Usman Ali added the boys title with a strong win over Northern’s Sion Gittins. Amy’s little brother Joe Royle made it a double family celebration by beating fellow Yorkshireman Akash Singh Nahal in the final of the Boys U11s, while Willow Morris of the Northumberland Club proved the best of the bunch at Girls U11 level, where she hit top form to see of Northern’s Zoe Shipsey in the final. There were many other local finalists in the plate competitions, Sam Broughton, Catriona Watling, Lucy Hutchinson, Cameron Hamilton, Lucy Anderson, Zoe Shipsey (all Northern), Joe Wareing, Tim Charteris, Ali Little and Callum Howie (all Jesmond), Olivia Steanson (Primrose), Verity Place (Consett), James Taylor (Alnwick) and Luke Radley of Hexham.